Every weekend me and some friends gather to consume adult beverages and watch movies. We tend to end up watching the good, bad and ugly of what's currently available. This weekend it was Spider-Man: Homecoming. Being the comic book movie geek, I had already seen this on the big screen but was totally up for a second viewing. 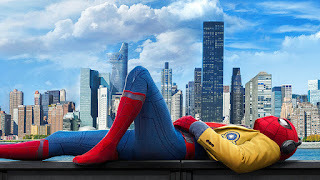 Spider-Man: Homecoming is a thoroughly enjoyable movie free from the burdens of a hero origin story. Since this version of Spider-Man was introduced in Captain America: Civil War, we can skip the radioactive spider bite and the 'Oh wow I have super powers" phase . All of that can make for a crowded and rushed movie. I might say that I missed the Uncle Ben storyline that leads to the iconic "With great power comes great responsibility" theme. The story picks up after the events of Captain America with Peter Parker back to his regular high school life and finding it an utter bore in contrast to duking it out with and against members of the Avengers. He impatiently waits for a call from Tony Stark that obviously is not coming any time soon. Through a series of nightly adventures that are not really that adventurous, he stumbles upon a group robbing an ATM and they are using what is obviously not technology of this Earth. For the uninitiated or those who just don't pay attention, this is a reference back to alien tech left behind in the first Avenger's movie. The villain of the piece is a working class anti-hero wannabe played excellently by Michael Keaton. You might be tempted to feel sorry for him in a populist sort of way until you realize he's really menacing and dangerous. The rest of the story plays out with a good balance of action, humor and character building. Tom Holland is youthful and exuberant as he web slings through New York and faces serious threats he's not prepared for. Jacob Batalon deserves a new Oscar category for best sidekick as Peter's best friend who helps him keep his secret... So enjoy the past attempts at brining Spider-Man to the big screen for what they are but I think we"re now getting the story the character deserves.